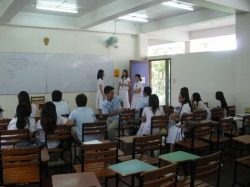 BSN 4A sponsored a forum on the "Gospel of Life" as part of Theology 141 requirement. This was held at J301 building Ateneo de Davao University on September 21, 2010. Dra. Eleanor Palabyab was the resource speaker.